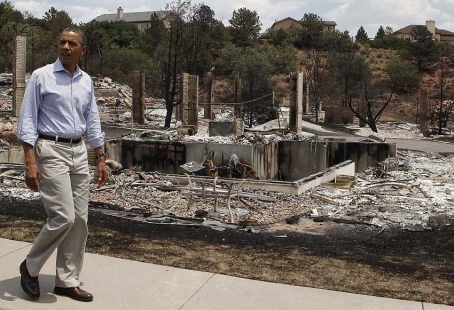 President Obama visited the wildfire-ravaged landscape in the foothills of Colorado Springs today, calling it a “Major Disaster,” and pledged to release federal funding to the counties affected. The Waldo Canyon fire in Colorado Springs, now considered the most destructive in the state’s history, has devoured 346 homes and killed at least two people. The Air Force announced this afternoon that it would activate all eight of its C-130s Saturday to spread fire retardant on the area. Just four had been used this week. The Air Force said it had not used all eight of its firefighting planes since 2008. The cause of the fire is unclear but officials will investigate to determine whether arson played a role, El Paso County Undersheriff Paula Presley told ABC News. “It’s really important that they [firefighters] get to the point of origin before we can ever get to that determination, anytime we have a fire of undetermined origin, we’re going to treat it as arson. … To ensure that it is thoroughly investigated and we get to the point of origin and make sure that either rule out arson, or determine that it is arson”.